CurrPorts is a free tool that displays the list of all open TCP and UDP ports that are currently open in Windows. The following information about the ports are displayed process name, process id, protocol, local port, local port name, local address, Remote port, remote port name, remote host name, state, remote address, process or program path, program name, user name, process services, process attributes and etc. Using this tool you can selectively close certain TCP connections and selectively choosing the ports you can kill the processes or applications. 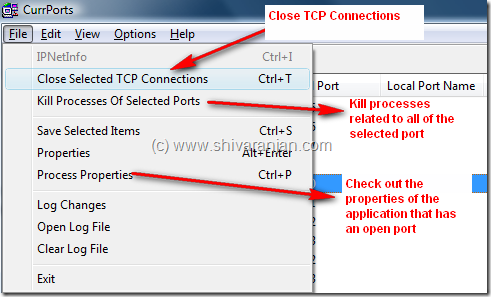 Incase you would like to know the properties of an application or process which has a TCP or UDP port open then you can see the properties of that application. All the information that is displayed can be can be exported as HTML report also if you would like to export selectively then the you can select entries and then export them. We tested this application in Windows Vista and Windows XP and this application does not require any installation hence can be used as an portable application in USB flash drives.